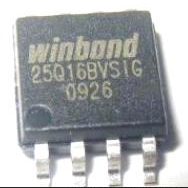 Winbond's W25X and W25Q SpiFlash® Multi-I/O Memories feature the popular Serial Peripheral Interface (SPI), densities from 512M-bit to 512K-bit, small erasable sectors and the industry's highest performance. The W25X family supports Dual-SPI effectively doubling standard SPI clock rates. 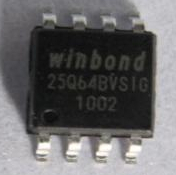 The W25Q family is a "superset" of the 25X family with Dual-I/O and Quad-I/O SPI for even higher performance. Clock rates up to 104MHz achieve an equivalent of 416MHz (50M-Byte/S transfer rate) when using Quad-SPI. This is more than eight times the performance of ordinary Serial Flash (50MHz) and even surpasses asynchronous Parallel Flash memories while using fewer pins and less space. Faster transfer rates mean controllers can execute code (XIP) directly from the SPI interface or further improve boot time when shadowing code to RAM. Additionally, some SpiFlash devices offer the new Quad Peripheral Interface (QPI) supporting true Quad Commands for improved XIP performance and simpler controller circuitry. Additionally, new ultra-small form factor packages are ideal for space constrained mobile and handheld applications. 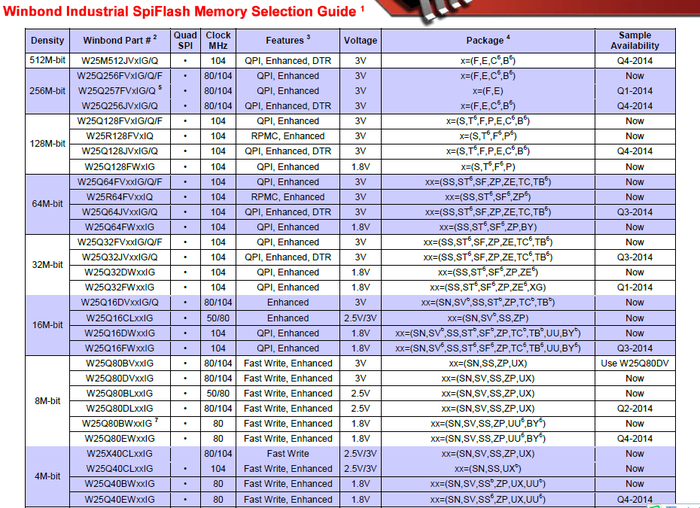 Refer toWinbond AutomotiveSpiFlashMemory SelectionGuide fordetailsofAutomotive products. 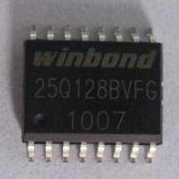 Winbondalsooffers theW29GLfamilyofParallelFlashproducts from 32Mb through512Mbdensitiescompatibletoindustrystandardx29GL products. 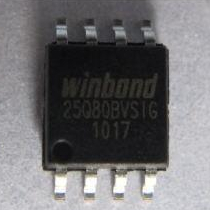 Please contact Winbond for automotive datasheet and support.